Crops are plants or animals or their products cultivated (grown, tended, and harvested) by humans as a source of food, materials, or energy. Humans are rather particular in their choice of crops. Though they select a wide range of useful species of plants and animals to raise, there are vast diversities of species available in particular places or regions. Farming can involve the cultivation of plants and livestock on farms, fish and other aquatic animals in aquaculture, and trees in agroforestry plantations. 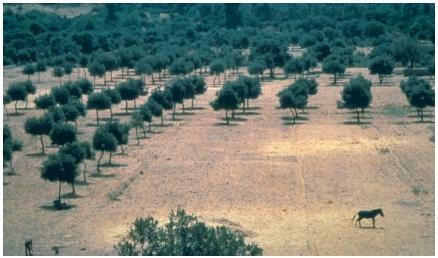 Agroforestry: Cultivation of crops of trees under managed conditions, usually in single-species plantations. Aquaculture: Managed breeding of aquatic animals and plants for use as food. Fallow: Cultivated land that is allowed to lie idle during the growing season so that it can recover some of its nutrients and organic matter. sugar cane, wheat, rice, corn (maize), white potatoes, sugar beets, barley, sweet potatoes, cassava, soybeans, wine grapes, tomatoes, bananas, legumes (beans and peas), and oranges. Most farm crops are managed as annual plants, meaning they are cultivated in a cycle of one year or less. This is true of all of the grains and legumes and most vegetables. Other species, however, are managed as perennial plants, which once established are capable of yielding crops on a continued basis. This is typically the manner in which tree-fruit crops such as oranges are managed and harvested. Diseases and severe weather can easily destroy the crops—animals or plants—cultivated on a farm. The effect can be economically devastating. One such agricultural blight occurred in England in early 2001. In February of that year, on a farm in Essex in eastern England, 27 pigs contracted foot-and-mouth disease (also called hoof- and-mouth disease). This virus affects animals with hooves, such as cattle, pigs, sheep, goats, and deer. Elephants, rats, and hedgehogs are also susceptible. Animals afflicted with the disease suffer from fever, followed by the eruption of blisters in the mouth, on the hooves or feet, on tender skin areas such as the udder in females, and in the nostrils. The blisters grow large, then break, exposing raw surfaces. Eating becomes difficult and painful. Because the soft tissues under the afflicted animal's hooves are inflamed, the animal becomes lame and may even shed its hooves. Pregnant female animals often abort and dairy cattle may give less milk. The disease is rarely fatal, although it can cause death in very young animals. Only very rarely is the disease transmitted to humans. When it has been, only mild symptoms have appeared. Foot-and-mouth disease is a highly contagious virus spread by direct or indirect contact. It can be carried by birds, on clothes, on the tires of vehicles, on dust, and in infected meat eaten by animals. It can travel many miles simply borne on the wind. Once an animal is infected, symptoms begin to show one to ten days later. Heat, sunlight, and disinfectants destroy the virus. Scientists have made progress in developing a vaccine against the disease, but the cost of vaccinating all susceptible animals (possibly up to $1 billion a year) is seen by some public officials as prohibitive. Consequently, to prevent a widespread outbreak that could cause massive production losses, infected animals must be destroyed by incineration and affected areas must be isolated. The most serious outbreak in the United States occurred in 1914 when animals in 22 states and the District of Columbia were stricken. The last major incidence of foot-and-mouth disease in England occurred in 1967. Some 440,000 animals were slaughtered, costing the farming industry $200 million (equivalent to $2.3 billion today). Within weeks of the 2001 outbreak in England, hundreds of thousands of animals were infected and had to be killed and incinerated. Many others who were not infected were killed as a precautionary measure to stop the spread. The virus soon showed up in other European countries: France, the Netherlands, and Ireland all reported confirmed cases. Farming was not the only industry hit hard by the outbreak. Tourism was also severely affected as footpaths and walking trails in the English countryside that meandered near farms were closed to the public in an effort to halt the spread of the virus. The tourism industry lost an estimated $150 million a week as a result. The total cost to all industries affected in England (farming, sports, tourism) was estimated to be over $13 billion. Some crops are cultivated to produce important medicines. An example is rosy periwinkle, which produces several chemicals that are extremely useful in the treatment of certain types of cancers. Other crops are cultivated to produce extremely profitable but illegal drugs for unlawful markets. Examples of these sorts of crops include marijuana, coca, and opium poppy. Enormous numbers of domesticated animals are raised by humans for use as food and materials. In many cases, the animals are used to produce some product that can be harvested without killing the animals. For example, milk can be continuously collected from various species of mammals, especially cows. Similarly, chickens can produce eggs regularly. However, these plus many other domesticated animals are routinely slaughtered for their meat. The populations of some of these domesticated animals are enormously large. In addition to 6 billion people, the world today supports about 1.7 billion sheep and goats; 1.3 billion cows; 0.9 billion pigs; and 0.3 billion horses, camels, and water buffalo. In addition, there are about 10 to 11 billion domestic fowl, most of which are chickens. Mad-cow disease (known properly as bovine spongiform encephalopathy or BSE) is another disease that can destroy a population of farm animals. Unlike foot-and-mouth disease, mad-cow disease primarily attacks cattle, and it is fatal. Even more, mad-cow disease has spawned a human form of the disease called variant Creutzfeldt-Jacob disease (vCJD). At present, vCJD is incurable and fatal. Scientists believe mad-cow disease is caused not by a bacterium or virus but by a self-replicating, abnormally folded protein called a prion. Scientists are still unsure of the complete nature of this agent. It resists freezing, drying, and heating at normal cooking temperatures, even those used for pasteurization and sterilization. Once inside an animal, it incubates for a period of four or five years. Once the disease appears, the animal is dead within weeks or months. The abnormal protein affects the brain and spinal cord of cattle, converting normal proteins into the abnormal form. The accumulation of abnormal proteins in the brain is marked by the formation of spongy holes. Cows afflicted with the disease grow ill-tempered and wobbly, lose weight, then suffer seizures, paralysis, blindness, and, finally, death. In 1984, on a farm in South Downs, England, a number of cows died from a strange malady that veterinarians could not identify. Two years later, the scientific community specifically diagnosed the malady as mad-cow disease. In 1988, officials in England ordered the destruction of stricken cows and banned the use of cows, sheep, and other various hoofed animals in cattle feed. However, the banned cattle feed was exported to other countries for another eight years. Between 1988 and 1996, nations in Asia alone bought nearly 1 million tons (0.9 million metric tons). Between November 1986 and December 2000, approximately 180,000 cases of mad-cow disease were confirmed in England. The epidemic peaked in the period 1992 to 1993 with almost 1,000 cases reported a week. Since that time, the disease has been reported in domestic cattle in Ireland, France, Portugal, and Switzerland, and in a number of countries that received cattle feed from England. No cases of mad-cow disease have been found in the United States. England has banned the recycling of farm animals and has stopped exporting meat-based cattle feed. It has also spent billions of dollars destroying and disposing of cows, both those that were infected and those that were merely old. The first person to develop symptoms of what turned out to be vCJD became ill in January 1994. Scientists now believe this brain-wasting malady, with symptoms similar to mad-cow disease, is caused by eating the meat of animals who suffered from mad-cow disease. The incubation period for vCJD is thought to be between ten and sixteen years. From the time it was first identified until December 2000, 87 cases of vCJD were reported in England, 3 in France, and 1 in the Republic of Ireland. Because of its long incubation period, scientists are unsure how many more cases of vCJD will arise around the world in the future. Aquaculture refers to the managed breeding of aquatic animals and plants for use as food. Increasingly, aquaculture or fish farming is seen as an alternative to the exploitation of wild species of aquatic animals and plants. Most freshwater aquaculture occurs in inland areas where there are many ponds and small lakes. Freshwater aquaculture is particularly important in Asia, where various species of fish, especially carp and tilapia, are raised in artificial ponds. In North America, the most common species of fish grown in small ponds are rainbow trout and catfish. Aquaculture is also becoming increasingly important along sheltered ocean coastlines in many parts of the world. In the tropics, extensive areas of mangrove forest are being converted into shallow ponds for the cultivation of prawns. In North America and Western Europe, the cultivation of Atlantic salmon became an extensive industry in the late twentieth century, using pens floating in shallow, coastal bays and sometimes in the open ocean. In agroforestry, trees are raised as a source of lumber, pulpwood, or fuel. In many regions, this sort of intensive forestry is being developed as an alternative to the harvesting of natural forests. In temperate zones, the most important trees grown are species of pine, spruce, larch, and poplar. Depending on the species and site conditions, these trees can be harvested after a growth period of only 10 to 60 years, compared with 60 to more than 100 years for natural, unmanaged forests in the same regions. In the tropics, fast-growing, high-yield species of trees are grown for use locally as fuel, animal fodder, lumber, and pulpwood. Various tree species include pine, eucalyptus she-oak, and tree-legumes. Slowergrowing tropical hardwoods, such as mahogany and teak, are grown for their high-quality lumber. Climate dominates agriculture, second only to irrigation. Crops are especially vulnerable to weather variations, such as late or early frosts, heavy rains, or drought. Because of their ability to grow within a climate range, rice, wheat, and corn have become the dominant crops globally. These crops all need a wet season for germination and growth, followed by a dry season to allow spoilage-free storage. Rice was domesticated in the monsoonal lands of Southeast Asia, while wheat originated in the Fertile Crescent of the Middle East. Historically, wheat was planted in the fall and harvested in late spring, coinciding with the cycle of wet and dry seasons in the Mediterranean region. Corn needs the heavy summer rains provided by the Mexican highland climate. Other crops are prevalent in areas with less suitable climates. These include barley in semiarid lands (those with light rainfall); oats and potatoes in cool, moist lands; rye in colder climates with short growing seasons; and dry rice on hillsides and drier lands. Although food production is the main emphasis in farming, more and more industrial applications have evolved. Cloth fibers, such as cotton, have been a mainstay, but paper products and many chemicals now come from cultivated plants. When farmers grow two or more crops alternately on the same land, they are rotating crops. Farmers rotate crops to control erosion; promote the fertility of the soil; and control weeds, insects, and plant diseases. Farmers have been following the practice of crop rotation since the time of the ancient Romans. With the advent of chemical fertilizers following World War II (1939–45), crop rotation fell out of favor somewhat. Farmers could provide their crops with nutrients without leaving some of their lands fallow (plowed and tilled but unseeded) each year. But some farmers eventually returned to the practice of rotating crops as a way to improve the structure and health of their soils. Farmers rotate crops to assure that the soil is covered for as much of the year as possible to protect it from exposure to water, wind, and other elements that cause erosion. On sloping lands, rotating crops increases the organic content (remains or residue of living organisms) and overall stability of the soil, further decreasing the chance for erosion. Another method farmers use to increase the organic matter of soil is to plant rotation crops that help build the structure of the soil, such as alfalfa, sweet clover, or red clover. When plowed under the soil, these crops decompose quickly, giving the soil a high level of nutrients. To control insects and weeds, farmers can rotate crops that have different characteristics: rotate weed-suppressing crops with those that do not suppress weeds and rotate crops susceptible to specific insects with those that are not. If the same crop is not grown in the same field one year after another, the reproductive cycles of insects preying on a specific plant are interrupted. Farmers can also control insects by planting next to each other certain crops that do not attract the same insects. can you please give me the list of types of crops. 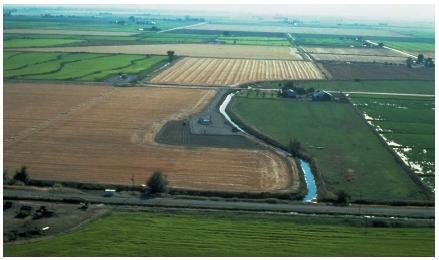 examples of wet crops and dry crops. why are they called so. this is a very helpful article, though i cant help but wonder what the aquaculture crops are? and, what is needed to be done to maintain them? How can I get access to Agriculture Materials, in terms of learning, because I am a student of the University of Liberia, Agriculture collage, majoring Agronomy. kindly help me learn from you too. your site is very educative and informative.